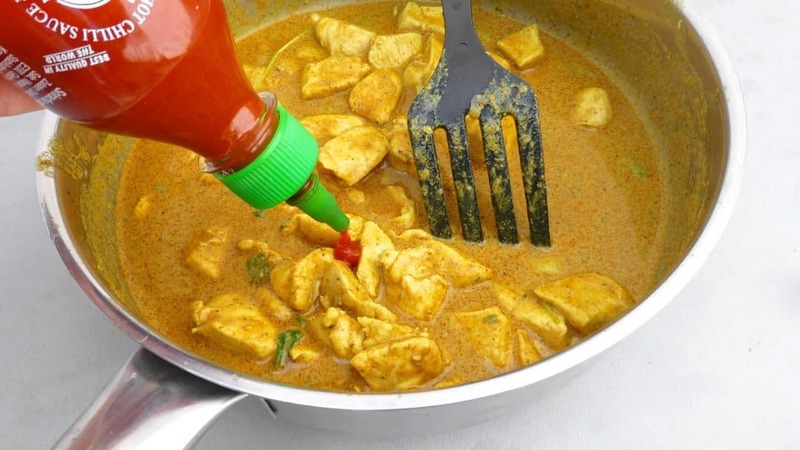 Panang Curry Recipe with Chicken | Simple. Tasty. Good. This creamy panang curry recipe brings back sweet memories of our lovely two months that we spent traveling around in beautiful Thailand. The creaminess of this curry and strong flavors are so addictive. 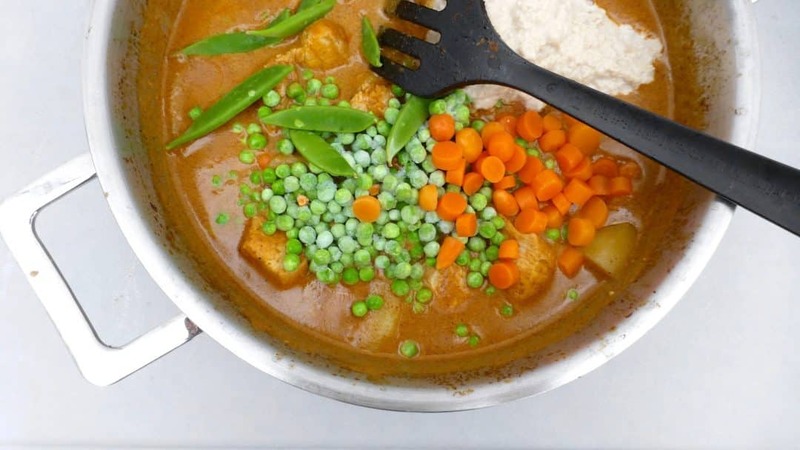 How do you spell panang curry actually? Panang is often spelled in various ways: phanaeng, phanang, panaeng or the easiest and my favorite way, panang. So panang is a type of Thai thick reddish light brown curry paste with a salty sweet and beautiful nutty peanut flavor. I sometimes like to add a couple of teaspoons of extra peanut butter to my panang curry to make it extra creamy and nutty. While we were in Thailand we followed some great Thai cooking classes. 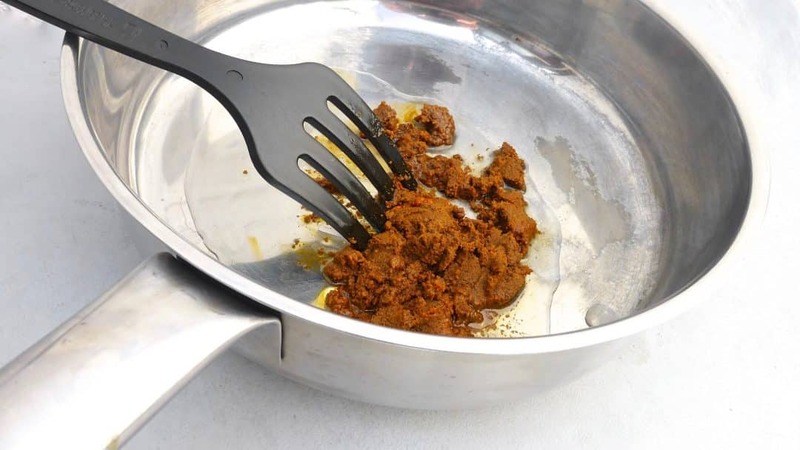 During on of them we learned how to make a traditional Thai curry paste from scratch using a huge pestle and mortar. It takes quite some time to prepare a fresh curry paste from scratch (and my arms were quite soar afterwards) but finding the right ingredients back here at home proves to be the hardest part. So basically that’s when a ready-made curry paste from my local supermarket or Asian grocery shop comes in handy. My local supermarket sells pretty good ones, so making a Thai curry at home for dinner is just piece of cake! You would be surprised to see how quickly you can prepare a stunning Thai chicken curry at home yourself in under 30 minutes… Thai curry for dinner, I love it! You can add whatever vegetables and basically any type of protein you want to the curry: I love green peas, red bell pepper and spring onions. 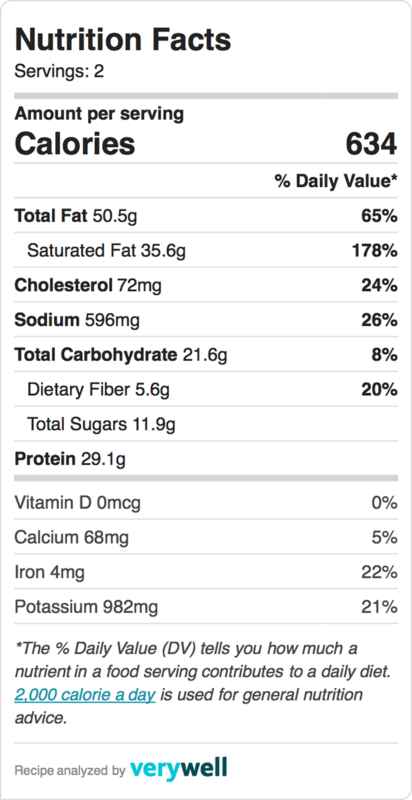 My favourite protein for curry has to be chicken breast. But I will also never say no to a powerful and strong beef curry. 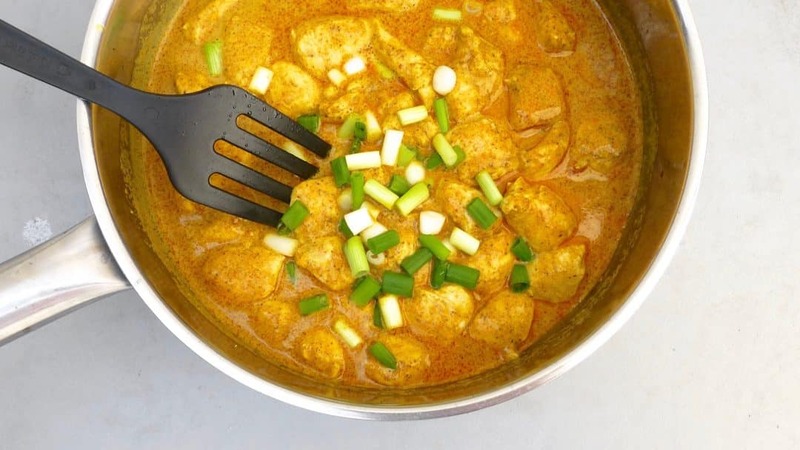 Check out another couple of curry recipes further down this page below the chicken panang curry and make your choice: a mild chicken massaman curry or a smoky red mackerel curry! I’ve made this panang curry numerous times before but the one in the picture was actually made by my sweet neighbour and talented home cook Helen! I thought that her Thai panang curry looked so vibrant and that curry sauce was just perfect and creamy so I plated it up nicely and snapped a picture of it… Beautiful right?! Enjoy! 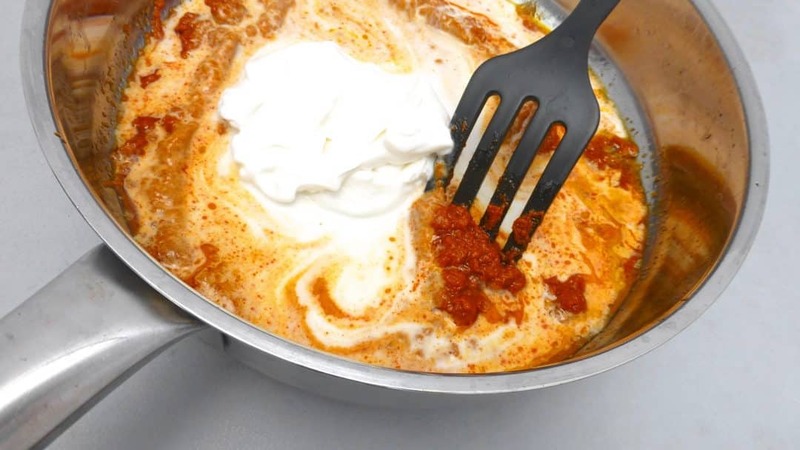 Pour the vegetable oil in a large non-stick pan and add the panang curry paste. Place the pan over medium heat and stir fry the paste for a minute until fragrant. Pour in the coconut milk and add the sugar and a teaspoon of the hot chili sauce. 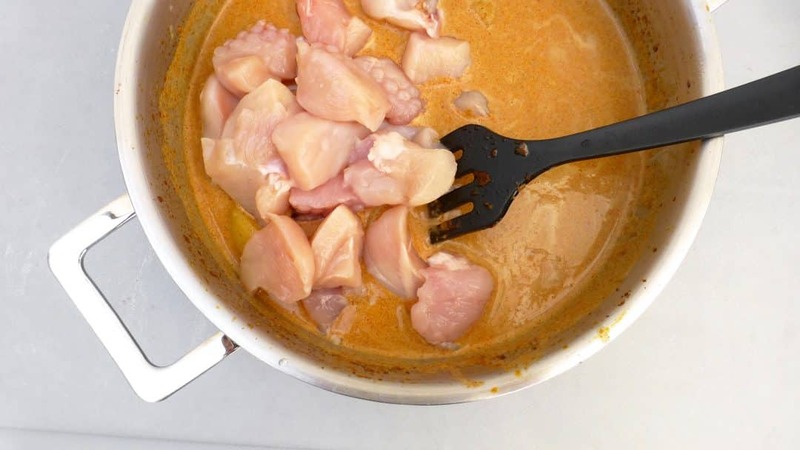 Stir well and bring the panang curry sauce to a gentle boil. Add the freshly diced chicken breast to the hot coconut milk. Stir all the ingredients well and then put a lid on the pan. 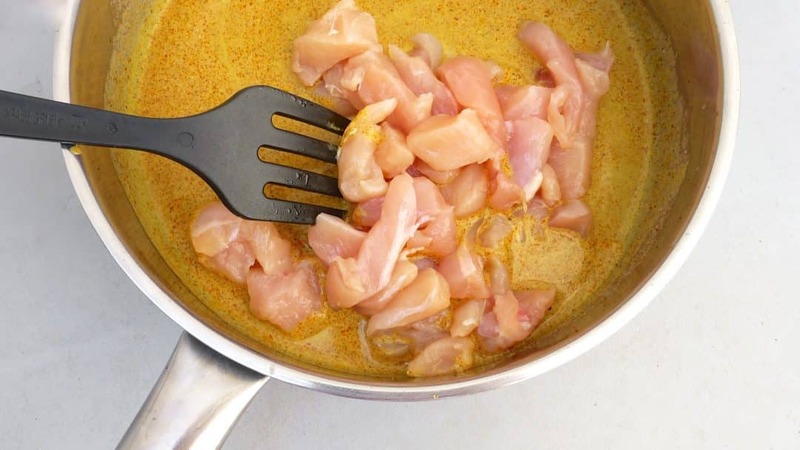 Let the chicken cook gently in the coconut panang curry sauce for 6 to 7 minutes over medium heat. Then add the freshly sliced spring onion, the frozen green peas and the freshly sliced red bell pepper to the panang curry. Stir the chicken panang curry well and turn the heat lower now. Simmer the curry for another 3 to 4 minutes or until the diced chicken breast is cooked through. Then check the seasoning of the freshly made panang curry and add extra salt, sugar or hot chili sauce to taste if necessary. 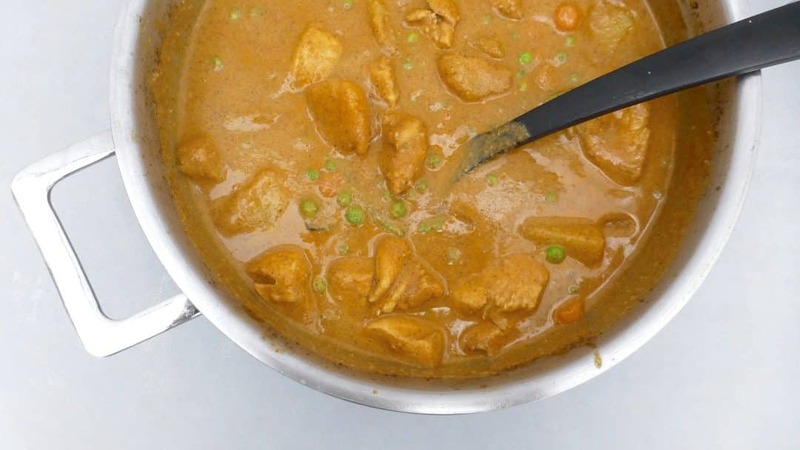 Scoop the creamy panang curry onto warm deep plates or into large bowls. Garnish with the fresh cilantro and mint and serve immediately while piping hot. 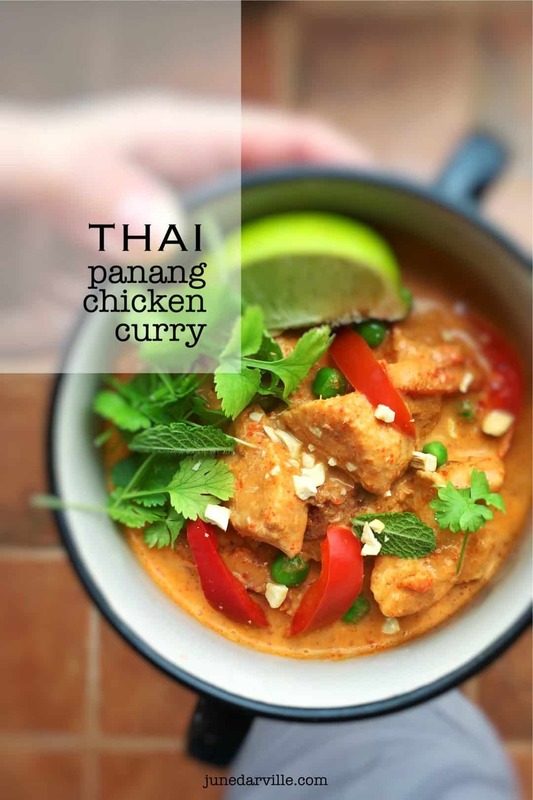 Did you enjoy my Thai chicken panang curry above? I have to admit that this one is quite a spicy meal (I love spicy food) but maybe you are looking for a non spicy milder type of Thai curry to make at home? Then I got good news for you: you will like this Thai chicken massaman curry without a doubt! I added some fresh sugar snaps and frozen green peas to my massaman curry here but it goes without saying that you can add other vegetables as well such as fresh broccoli, cauliflower, baby corn, carrots or even eggplant would also be great! Whenever I can I will try to stop by my local Asian supermarket and buy a couple of small Thai eggplants. Those are just perfect for curries! Thai eggplants are very different from the purple eggplant we all know. While traveling in Thailand I also came across massaman curries containing raisins, boiled potatoes and whole cashew nuts instead of peanuts. What I love a lot about this curry is the addition of potatoes in it. This means that you don’t have to bother making cooked, steamed or fried rice to serve along with your massaman curry. 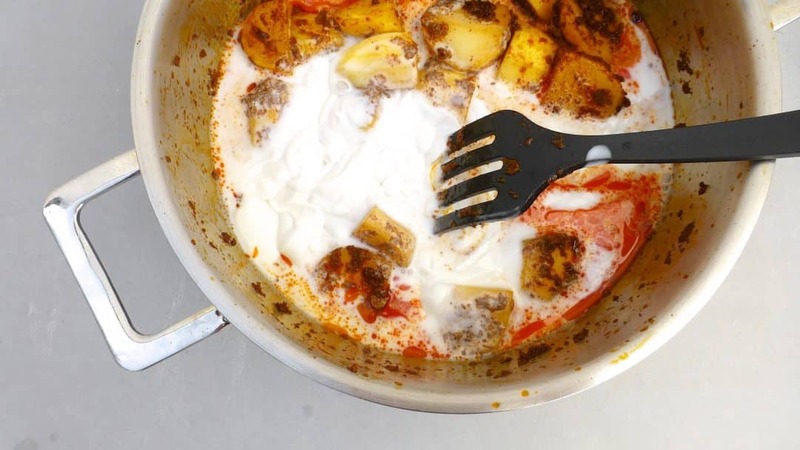 I often make this massaman curry with beef and potatoes as well! This curry actually looks very similar to my Japanese chicken curry: the sauce and ingredients look a bit similar. But watch out, the flavor is totally different. Japanese curry is another delicacy but it has nothing to see with Thai curries. So how does Japanese curry taste like? 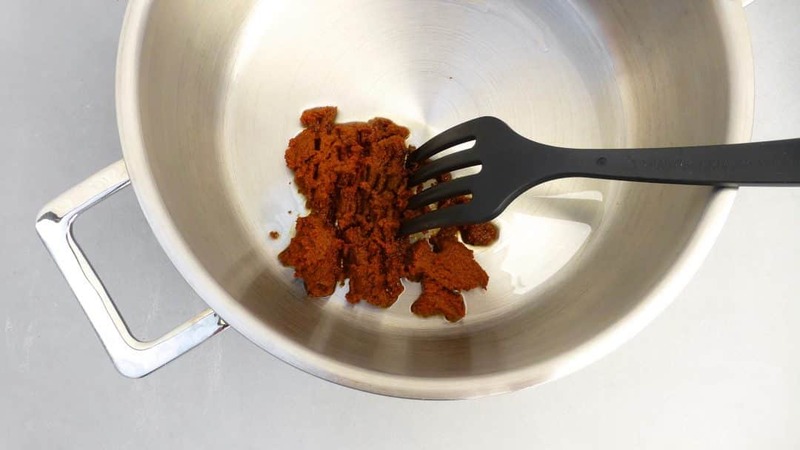 Well here are the main ingredients that go into a homemade Japanese curry sauce: butter, flour, garam masala (or curry powder), cayenne pepper, ketchup and tonkatsu sauce (or worcester sauce). The curry is sold in tablets and all you have to do is add one or two to taste to water or vegetable stock, no coconut milk needed like in Thai curries! But the creaminess is just the same. See, miles away from the fresh massaman curry! Main ingredients in a massaman curry paste are chili, lemongrass, garlic, ginger, cardamom, cloves, cumin, peanuts and nutmeg. Peel and chop the potatoes. Dice the fresh chicken into bite-size pieces. 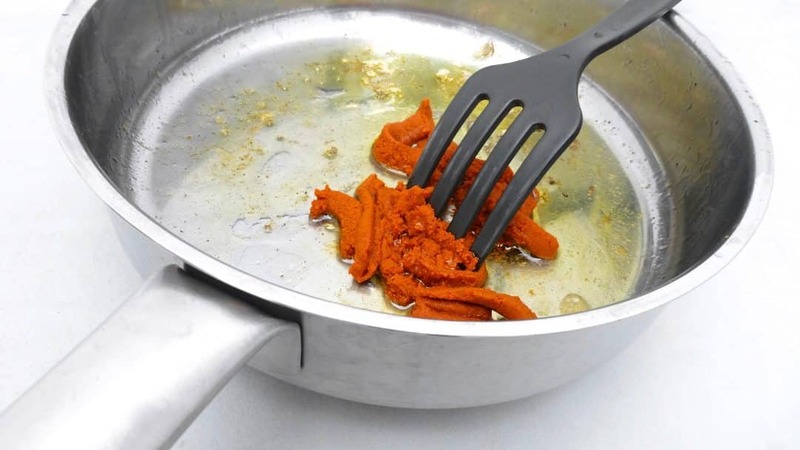 Pour a splash of vegetable oil in a large frying pan or wok and place it over medium heat. Add the massaman curry paste once the oil is hot. Stir fry the curry paste for a minute. Then add the chopped potatoes. 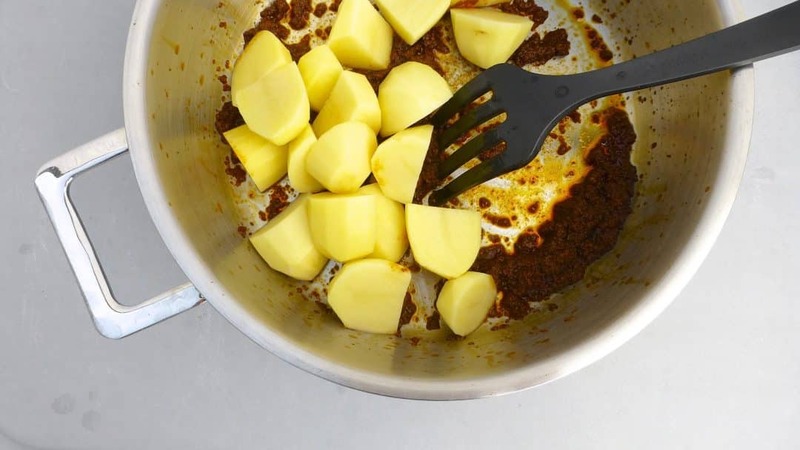 Fry the potatoes and the curry paste for 2 to 3 minutes. Then add the coconut milk. Stir and bring the coconut milk to a good boil. Keep it there for 7 to 9 minutes until the potatoes start to soften. Then turn the heat lower and add the freshly diced chicken. Cook the diced chicken in the massaman potato curry for 3 minutes. Then add the fresh sugar snaps, the crunchy peanut butter and the frozen green peas to the creamy curry. Stir all the ingredients well and turn the heat very low. Put a lid on the pan and let the curry rest for 5 minutes. Check the seasoning of the massaman curry and add extra pepper or salt to taste if necessary. Scoop the massaman curry into large bowls or deep plates. Sprinkle with the shredded cilantro, mint and the crushed peanuts (or cashews). Serve the chicken massaman curry piping hot. 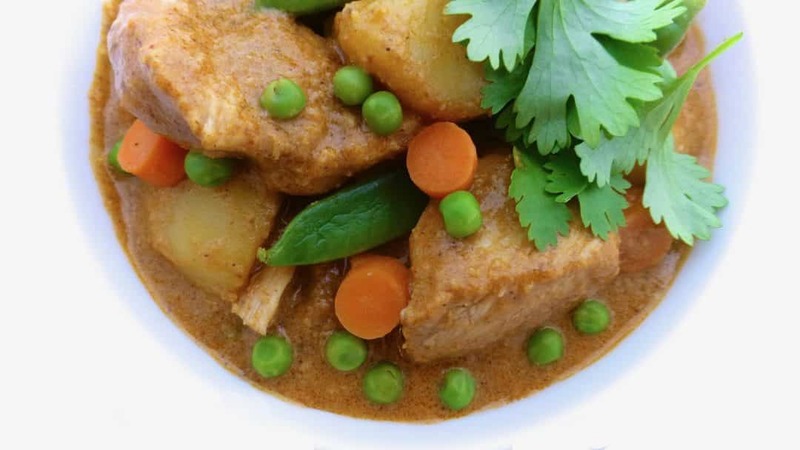 Chicken, beef, pork… the perfect protein for curries! But how about adding fish or seafood? Have you ever made a fish curry before? 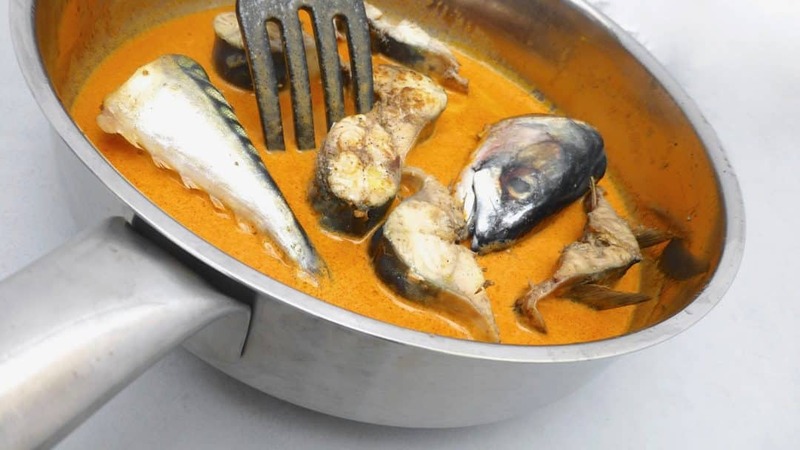 Take a look at my next red curry with mackerel! Red curry paste and mackerel are just made for each other. I love that strong fish flavor in combination with the strong and spicy red curry! I have another version of a mackerel curry, but this one is totally different from this red curry: I’m talking about my Mauritian vindaye poisson! It’s actually a vinegar mackerel curry with onions and cilantro. If you love vinegar, you will certainly love this one! Also check out another fish curry that I made some time ago: my mild Thai yellow curry with prawns, white fish fillets, sweet mango and fresh zucchini! 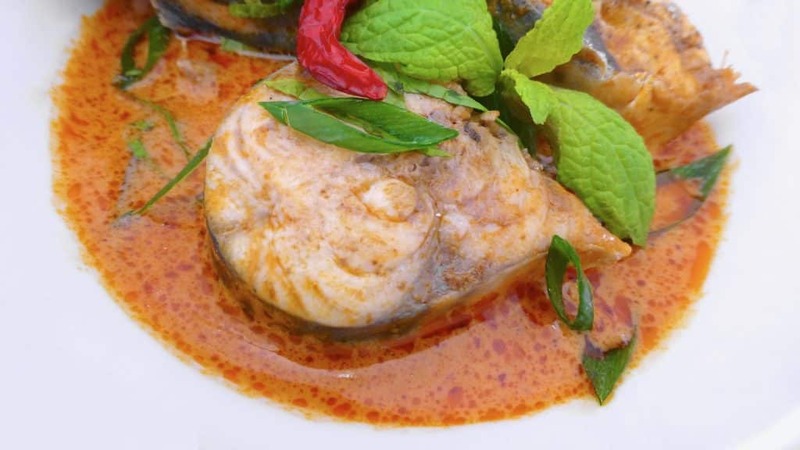 You'll adore this Thai red mackerel curry! 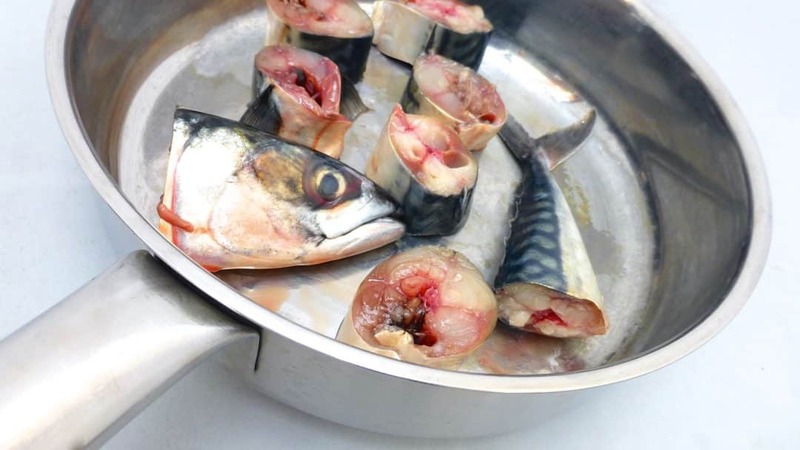 Rinse the fresh mackerel under cold running tap water and pat it dry with some kitchen paper. Slice the fish into smaller bits. Heat a splash of vegetable oil in a non-stick pan or wok. Once the oil is hot, add the bits of fresh mackerel. Quickly bake the mackerel in the hot oil for a couple of minutes until browned on both sides. 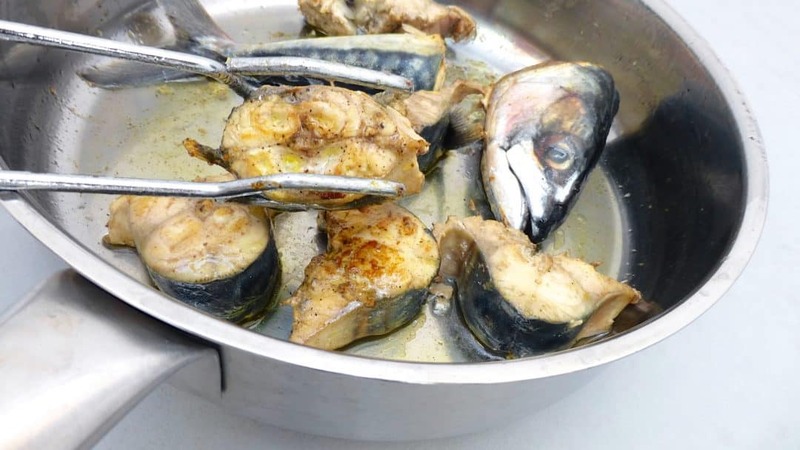 Remove the mackerel from the pan and put it on a clean plate until needed later. Pour another splash of oil in the same pan you cooked the fish in (don’t get rid of the juices and browned bits in the pan). Place the pan over medium-high heat and add the red curry paste once the oil is hot. Quickly stir fry the red curry paste for a minute until fragrant. Pour in the coconut milk and add the sugar. Season with a little pinch of pepper. Cook the red curry for a couple of minutes. Then add the baked mackerel back to the pan. Turn the heat low and simmer the fish in the red curry for 10 to 12 minutes until the fish is cooked through. Check the seasoning of the curry and add extra pepper, salt or sugar to taste if necessary. Scoop the cooked fish onto plates, drizzle with the rest of the red curry sauce and serve hot.